After exploring France and the Sahara from end to end, above and below ground, for 20 years and discovering over 200 art caves – most of which must be kept secret for their protection, I began sharing a few discoveries by leading archaeological tours and expeditions for charitable purposes. For the last ten years, for example, I have annually contributed the possibility of visiting secret prehistoric art caves near Paris to a charity auction which generates funds for free nursing, day care, and other assistance to the needy. The 2008 winners of the “Possible Dreams auction” were Alan Dershowitz and his wife, Carolyn Cohen, who spent two days seeing a few masterpieces from the local cornucopia of engraved and painted caves. Another repeat winner, who had already bought the “dream” and spent a week seeing caves a few years before, took me up on an invitation to see some of the dolmens, tumuli, menhirs and alignments of the Mayenne and Morbihan instead. 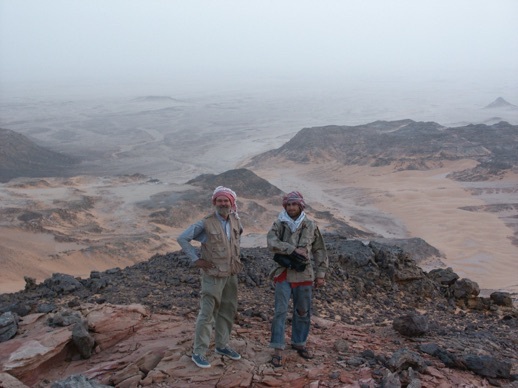 The same winner even came along as a volunteer when I led a three-week archaeological census of the Great Sand Sea and Gilf-el-Khebir (which included prehistorians from the CNRS, GREPAL and the Sorbonne) - and, to everyone’s amazement, is ready to return immediately. Thank you, Steve! Other winners, Dan Burstein and his wife, Julie O’Connor, came to see the local caves, but ended up tagging along through the Dordogne and Lot to see other masterpieces in what became a prehistoric and gastronomic voyage of discovery. ...and wait patiently for me to come above ground. “Duncan Caldwell took us to secret caves that only a handful of people know about. Several of these were discovered by Duncan himself. What we saw was simply amazing: primitive carvings in the walls and ceilings of caves, some figurative, some abstract, several sexual, all interesting. Duncan is the perfect guide: extraordinarily knowledgeable, funny, accessible and a great teacher. We spent two days in the caves and these were among the most interesting days I have had. It turned out to be far beyond my wildest expectations.” By Alan Dershowitz, Felix Frankfurter Professor of Law at Harvard Law School, and author of numerous books. 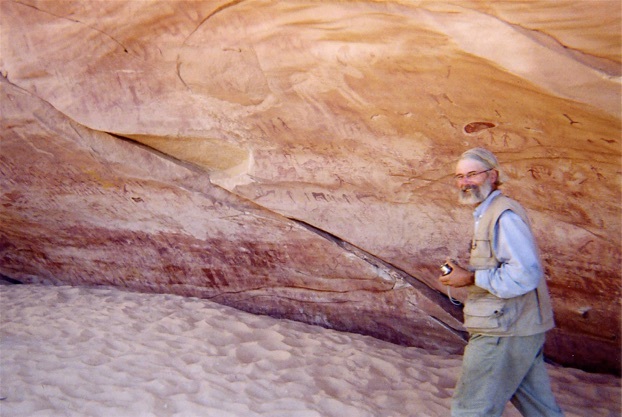 “Our experience with the eminent pre-historian, Duncan Caldwell, in traveling through France and exploring his physical and intellectual discoveries regarding cave art and human prehistory, gave new meaning to the concept of “adventure travel” for our whole family. The experience was amazing, fascinating, and thrilling: it was eye-opening, paradigm-shifting, and mind-bending. Traveling with Duncan, viewing his little known and rarely glimpsed personal findings – as well as his novel interpretations and context for other experts’ prior findings at some of the most famous caves in France – is about as close to time travel as we are likely to get. We were able to imagine the world of 15,000 to 20,000 years ago, as our human forebearers began to paint and engrave on cave walls and rocks. ... If you must borrow something from pop culture, try The Da Vinci Code: Imagine yourself in the company of a real-life Robert Langdon when you travel with Duncan Caldwell, as he helps you to experience the emotional/intellectual/visual/symbolic stew of the evolutionary cosmology of the mind 10,000 years or more before human beings developed written language to record their stories. Duncan allows the modern traveler the opportunity to understand the stunning visual images on these cave walls and the powerful secret, sacred symbols used by men, women, and children twenty millennia ago. Like an Egyptologist who can read hieroglyphics, Duncan can read the language that prehistoric humans have left as their legacy to us. ... There is a raw, awesome power to encountering these secrets, and to being among the handful of people to have seen what Duncan has found and to have the chance to learn from his outside-the-box and revelatory interpretations of prehistory. Imagine being a space tourist with Carl Sagan as your rocket ship’s commander, and you might have a sense of this encounter.” By Dan Burstein, author of Secrets of the Code and numerous other books.